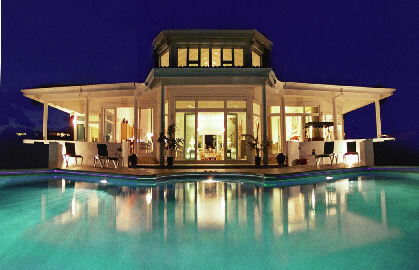 Bliss Villa is one of the most recent additions to Anguilla's luxury villas. Built on 0.75 acres of ocean front property in a unique, contemporary style, Bliss Villa provides serene views of the gorgeous clear blue Caribbean waters and of nearby St. Martin and Saba beyond. Bliss's over 4000 square feet of living space including air-conditioned, ocean-front, king-sized and queen size bedroom suites with en-suite private bathroom, a fully equipped gourmet kitchen and dining room and spacious living room offer spectacular ocean views! Bliss Villa's east-end location places you approximately 12 minutes from Wallblake Airport and 22 minutes from Blowing Point Ferry. You are only a short drive away from any of Anguilla's more than 30 beaches and dozens of restaurants. Maid service, two cable TVs with DVD/VCRs, high speed cable internet access, and a superb sound system all add to your comfort and enjoyment. To complete your Caribbean experience, the following services can also be arranged: On-site Chef, Airport Pick Up, Car Rental, Babysitting, Masseuse, Personal Trainer, Secretary, Nanny, Driver.